Winners and losers typically have the same goals but obviously different outcomes. Goals are good but without a system of practiced habits in place, goals alone will not lead to success. It's not the goals that determine success, systems do. "You will not rise to the level of your goals. You will fall to the level of your systems." Kubick says of Reese "He is a brilliant human being", "He's brilliant at reading people and understanding people. Alcalde says that Reece has a "combination of smarts, intuition, hard work, and a dash of serendipity". His teams win an amazing 32 consecutive conference titles from 1980 thru 2017. He coaches 42 individual NCAA champions, 204 All-Americans and 26 Olympians who have won 29 gold medals. 1992 he is the coach of the men's swimming team at the Olympics in Barcelona, Spain. Voted NCAA Men's Swimming Coach of the Year eight times: 1981, 1988, 1989, 1990, 1992, 1996, 2000, 2001. ASCA (American Swim Coaches' Association )Coach of the year in 1991, 2005, 2006, and 2009. He wins the coveted CSCA award in 1991 for the coach who contributes the most to the sport of swimming. Reese is inducted into the Texas Sports Hall of Fame as part of the class of 2002, the the Hall of Honor in 1996. In 2002 he is inducted into the International Swimming Hall of Fame. Eddie Reese developed the "wheels" method which involved a swimmer pulling himself up the Ramps at Memorial stadium on a 2 x 4 plank with lawn mower wheels on the back. SMU maintains their edge of the Longhorn men's swim team by beating them for the 23rd consecutive time. John Henry, Gary Grimsby, Ned Stack, and Duncan Hawthorn sets a school record in the 400 relay and John Kenny sets a school record in the 200 butterfly. Team finishes only 12 points behind the Cal Berkeley national champions. After 23 consecutive years of losing to SMU the Longhorns finally win the SWC. Swimmers win 12 of 18 events at the SWC meet setting one American record, 7 conference records, and 10 school records. 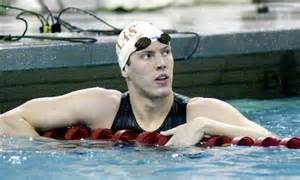 Clay Britt is the first Longhorn ever in the history of Longhorn swimmers to win an individual NCAA National Championship. He sets an American record in the 100 backstroke. Clay Brit, Scott Spann, Nick Nevid (no picture), and (Kris Kircher) are the first Longhorns to ever win the national championship in a relay event. Co- Captains were Scott Spann and Kris Kirchner. After finishing a school-best second at the 1980 NCAA Championships, the Longhorns enter the '81 season as the favorite to claim their first-ever national crown. Not only did they do just that, but they did it at their own pool. Scott Spann (100 butterfly) Clay Britt (100 backstroke) and Kris Kirchner (200 freestyle) each win titles as Texas outdistanced runner-up UCLA 259-189. The Horns break school records in 6 events and SWC records in all relays. At the national meet the Longhorns set three American records, two U.S. records, and two NCAA records. Reese is named Coach of the year. At the University of Texas under Coach Eddie Reese, Paulus is a four-year all-American, five-time SWC champion, two-time NCAA champion and helps the Longhorns win their first-ever NCAA Championship in 1981. In 1980 he sets the world record and qualifies for the United State's Olympic swim team; however, he did not attend the Olympics due to the U.S.'s boycott. Rick Carey is the first Longhorn to ever win the NCAA Championship in the 100 and 200 backstroke. He won in American record times. 1981- 1985 Matt Scoggin is an Olympian diver for Texas under Mike Brown. . Matt will become the Head Diving Coach at Texas in 1996. At the SWC meet the Horns won the first 10 of 11 events in routing SMU. The 400 yard medley relay consisting of Carey, May, Rives, and Ellison said a best time nationally for the year. Rick Carey wins the NCAA championship in the 200 backstroke three years in a row and the 100 back two years in a row. Chris Jacobs, Shaun Jordan, Keith Anderson and Doug Gjertsen are the first Longhorn relay team to win the 800 free in NCAA history. Shaun Jordan is on 4 National championship teams. Gjertsen and Stackle each capture titles (200 backstroke and 200 breaststroke) and three UT relays finish with top honors to help Texas edge runner-up USC by 54.5 points. Of UT's 424 points, 304 are scored by individuals and a whopping 179 are from the sophomore class. The versatility of Doug Gjertsen, Kirk Stackle and Chris Jacobs combine with quality depth to lead Texas to its second NCAA title. Doug Gjertsen is the first Longhorn to ever win the NCAA Championship in the 200 free. Kirk Stackle wins an individual title at the NCAAs for three straight years. Kirk Stackle is the first Longhorn to ever win the NCAA Championship in the 200 and 100 breaststroke. Sophomore Shaun Jordan (100 freestyle) and Kirk Stackle (200 breaststroke) each capture individual titles as Texas cruises to its second straight title and finishes the 1980s with three national crowns. Doug Djertsen competes in 13 races in three days, scoring in three individual events and anchors all four relays as the Longhorns tally 475 points to runner-up Stanford's 396. Jeff Thibault, Kirk Stackle, Shaun Jordan and Doug Gjertsen set the American record in the 400 Medley. The Horns set an NCAA scoring record while winning their third-straight title, outdistancing USC 506-423. UT has 15 athletes score in 20 events, as Doug Gjertsen (200 freestyle) and Kirk Stackle (100 breaststroke) win titles and Shaun Jordan tallies three second-place finishes (50, 100 freestyle and 100 butterfly). UT wins four of five relays, setting American records in the 400 medley relay and 800 freestyle relay. Josh Davis is a freshman. Shaun Jordan wins the (50 freestyle/ 100 freestyle) while UT post wins in four of five relays in route to its fourth consecutive NCAA title. The Horns win the opening event, the 200 freestyle relay, by setting an American record (1:17.89), and lead from the start to finish in taking the title with 476 points to Stanford's runner-up total of 420. UT is the first school since USC (1974-77) to win four straight NCAA swimming and diving crowns. 1992 - Coach Eddie Reese 4-3 Finished 2nd at the National meet. Stanford demolished Texas at the championship meet 632 to 356. Jason Rhodes won the 3 meter dive. Jeff Thibault set a conference record in the 100 and 200 backstroke and Matt Stahlman was the SWC highpoint swimmer. Team finishes runner-up in the NCAA and wins their 15th consecutive SWC championship. Jason Fink, Josh Davis, Chris Eckerman and Gary Hall Jr. set the American, NCAA and U.S open record in the 400 meter relay. Swimmers set 5 SWC swim records . Josh Davis is a 23 time All American and 4 time NCAA Champion. Neil Walker came to UT as a freshman in 1994 and is a huge influence on Longhorn teams for the next 14 years. Under Eddie Reese and Kris Kubik, Walker earn 25 all-American awards, back-to-back NCAA individual titles and six Big 12 conference titles. He is also a member of the 1996 NCAA championship team. He set an NCAA record in the 50-yard freestyle and swims the 100-yard back in 44.92 seconds, setting an American, U.S. Open, and NCAA record. Competing for Team USA for 10 years (1997-2007), including the 2000 & 2004 Olympic Games, Walker earns 17 gold medals, eight silver medals and one bronze medal. He is elected USA National Team captain in 2005, 2006 and 2007 during the last few years of his competitive career. As of 2015 Neil Walker has the fastest Longhorn time in the 100 Back. Jason Fink, Josh Davis, Chris Eckerman, Gary Hall, Jr set the American record in the 400 free. Horns win their 16th SWC championship . Matt Hooper wins the 1,650 freestyle . It is his 8th career SWC title , the most ever by a Texas swimmer. Derek Howorth ,Marty Hubbell , and Matt Beck also win their events. 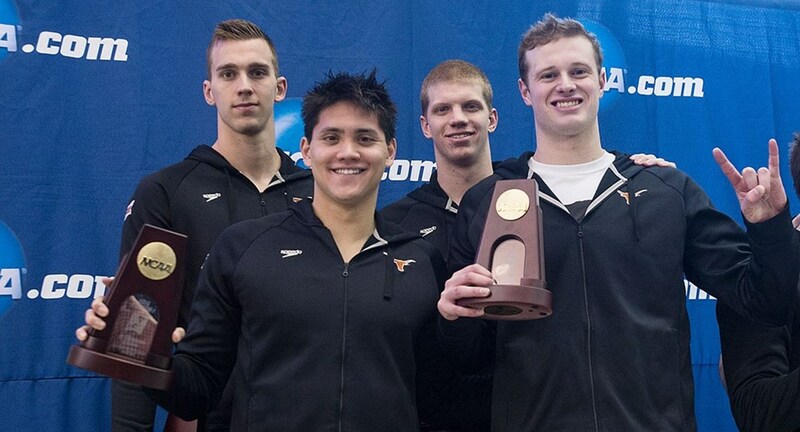 15 swimmers qualify for the NCAA meet and the Horns place 4th at the Championship meet. Texas took an early lead with a victory in the 200 freestyle relay, and never looks back as UT is the only team to score in every swimming event. The Horns did not win an individual event, but earn five silver medals to demonstrate a strong team effort. Only the 1948 Michigan and 1983 Florida squads pulled off the winless feat before. The Longhorns defeat Auburn 479-443.5, and in defending the "home pool," made the phrase "Our Home, Our Pool, Our Title," a reality once again. 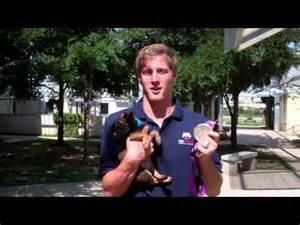 2005-Aaron Peirsol is USA Swimming Athlete of the the Year. He turns pro after just two years at Texas but still wins 6 NCAA championships and 11 All American honors. As of 2015 Aaron Peirsol has the fastest Longhorn time in the 200 Back. Troy Dumais leads the Longhorn charge with victories on both the one- and three-meter springboards to help Texas capture its seventh NCAA title. Matt Ulrickson claims individual gold in the 100-meter backstroke. 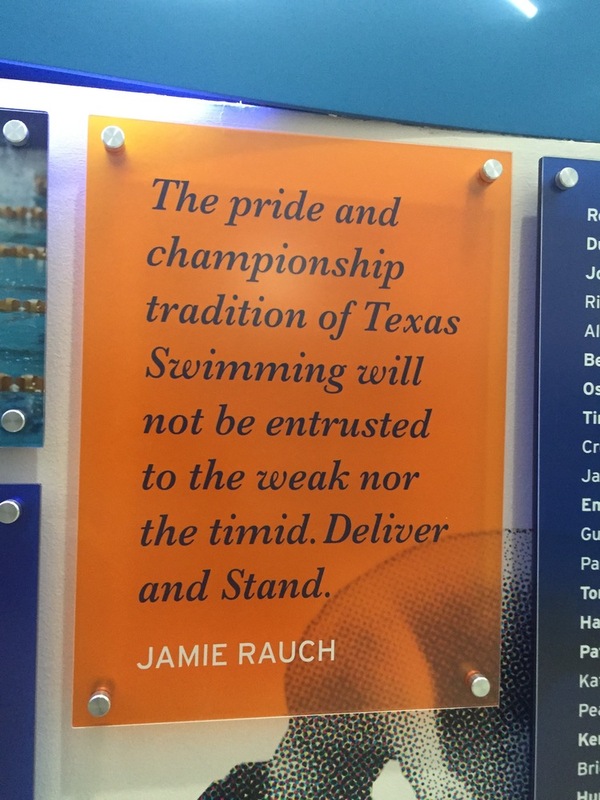 Texas relay teams also produce bringing home titles the 800-meter freestyle relay and the 200- and 400-meter medley relays. In all, the Longhorns place 29 swimmers and divers in individual-event finals to score 538 points and finish 153 points ahead of second place Auburn (385). Nate Dusing is the first Longhorn to ever win the NCAA Championship in the 200 individual medley in an American record time. Nate Dusing tallys two individual titles in the 200 IM and 200 backstroke, while leading the Longhorns to four relay crowns in the 200 and 400 medley and 400 and 800 freestyle relays- all setting NCAA and American records. Ian Crocker participates in the Olympics in 2000,2004, 2008. 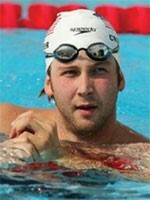 He is 2004 NCAA Swimmer of the Year and 10 time NCAA Champion and 22 time All American. He is the only the 3rd athlete in the history of the 100 butterfly to win the National championship all 4 years. As of 2015 Brendan Hansen has the fastest Longhorn time in the 100 Breaststroke. In 2001 Brendan Hansen wins the 100 and 2002 breaststroke and in 2002 Brendan captures the 100- and 200-yard breaststroke titles for the second consecutive year. Branden Hansen is a 13 time NCAA Champion and 16 time All American. He is the first person in NCAA history to win the 100 and 200 breaststroke 4 years in a row. The Longhorns captured their third consecutive NCAA Championship and ninth title in school history in dramatic fashion, coming back to take the lead in the second-to-last event of the evening, then holding on in the final event for the overall team victory. Texas scored a total of 512 points, finishing just ahead of second-place Stanford (501). The 11-point edge was the closest margin of victory since the advent of the 16-place scoring system in 1985. Troy Dumais Is The Only UT Athlete That has Participated In The Olympics Games 4 Times. As of 2015 Jimmy Feign has the fastest Longhorn time in the 50 free and 100 free. As of 2015 Dave Walters the fastest Longhorn time in the 200 free. As of 2015 Ricky Berens has the fastest Longhorn time in the 200 IM. Michael McBroom is the first Longhorn to ever win the NCAA Championship in the 1650 free. As of 2015 Michael McBroom has the fastest Longhorn time in the 1650 free. As of 2015 Clark Smith has the fastest Longhorn time in the 200 butterfly. As of 2015 Will Licon has the fastest Longhorn time in the 400 IM. As of 2015 Clark Smith has the fastest Longhorn time in the 500 free. 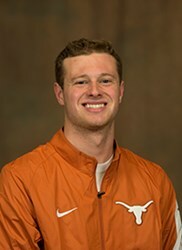 As of 2015 Jack Conger has the fastest Longhorn time in the 100 Butterfly. Townley Haas is the first Longhorn to win the NCAA Championship in the 500 free. Townley Haas, Clark Smith, Jack Conger and Jimmy Feigen finalized berths on the 2016 U.S. Olympic Men's Swimming Team. Link to swimmers participating in the Rio Olympics is below.